Iraq’s Ministry of Interior (MoI) said on Tuesday that they had arrested a high-ranking leader of the Islamic State (IS) known as “Abu Ammar” southeast of Kirkuk Province amid the terrorist organization’s continued sporadic attacks in the country. “Through field follow-up, the Intelligence Divisions of the Federal Police… were able to capture one of the leaders of the Da’esh (IS) terrorist organization,” MoI Spokesman Maj. Gen. Sa’ad Ma’an said in a statement. The arrest came after the US-led anti-IS coalition announced on Sunday that Iraqi forces, with the support of coalition troops, killed dozens of IS militants in separate military operations across different parts of northern Iraq. On Oct. 31 in the Makhmour Mountains, a joint operation involving Iraqi Special Operations Forces and coalition troops killed approximately 20 IS insurgents. The day before, Iraqi security forces and Iraqi Counter-terrorism services, supported by the coalition, conducted multiple strikes against IS targets on Khanukah Mountain in Salahuddin Province, resulting in the death of five senior jihadist leaders and more than 30 other militants, according to the statement released by the coalition on Sunday. 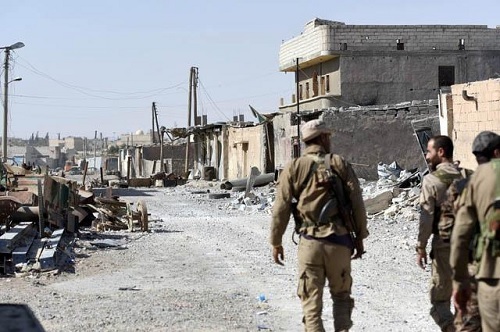 Despite Iraq declaring a final victory against the extremist group last December, IS fighters continue to launch sporadic attacks, including bombings, assassinations, and kidnappings in previously liberated areas.